Greenways are "Communication routes reserved exclusively for non-motorised journeys, developed in an integrated manner which enhances both the environment and quality of life of the surrounding area. These routes should meet satisfactory standards of width, gradient, and surface condition to ensure that they are both user-friendly and low -risk for users of all abilities. In this respect, canal towpaths and disused railway lines are a highly suitable resource for the development of greenways" (Declaration of Lille, 12th September 2000). 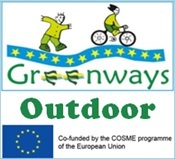 EGWO is a consultancy and inventory platform for greenways. Its objective is to record all possible greenways in Europe in order to provide a useful database for the public and associations which are working to create or promote these infrastructures. Greenways are transport corridors, developed along independent routes following past or disused communication pathways and tracks that are available for non-motorised soft traffic. ease of passage: their slopes, either low or zero gradient, allow their use by all types of users, including mobility impaired people. safety, due to their separation from roads, and to appropriate safeguards at the intersections. continuity with suitable solutions for any difficulties and alternative routes. respect for the environment along itineraries and encouraging its respect by the users. Greenways provide facilities based on the infrastructures and fixtures of the old pathways and tracks, such as disued railway stations and lock keepers' houses. These facilities can take several shapes: general accomodation, museums, bicycle rentals, accomodation for equestrians, hostels... They serve local users as well as tourists. The greenways should have information available such as maps and brochures, on the route itself and on access to nearby sites of interest is supplied. You are managing a greenway and you want publicise your work to as many users as possible. Your information is of great interest to us and we ask you to contribute to help complete this database.